Liquid waste presents a unique challenge and opportunity for landfill operators. There are many factors that should be figured into the decision on whether to locate a liquid bulking (solidification) operation at your landfill facility. These factors can be grouped into four categories to form a decision matrix: business case, environmental considerations, future growth and operational considerations. By clearly understanding all the pros and cons to co-locating a solidification operation at your landfill facility, the decision will be best suited to serve business needs now and in the future. 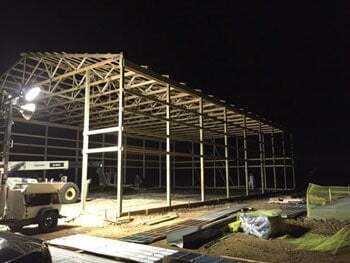 Figure 2: Pole barn covered storage construction in process for solidification facility. The solidification facility should be located near primary landfill access roads and adjacent to the landfill working face when possible. This adjacency will make access for unloading vehicles easier. In addition, locating it near the landfill working face will minimize road maintenance costs if the solidification facility is far from the working face. An added consideration is to identify a location for the facility outside of any future cell development to avoid having to demolish/re-construct the facility to accommodate future growth. Once a good location is set, the actual facility will need to be designed. Key elements to incorporate in the design include the access roads/turn-arounds for truck access to the facility, the bulking pits/tank(s), media storage and truck wash-out. The tanks (typically in-ground liquid-tight assemblies) are usually concrete or steel construction and could have a secondary liner to ensure complete liquid containment if required. These tanks need to be designed to hold up to years of hard service as well as sized to work with the yellow iron that will be available at the facility. The solidification facility will also need an area for reagent/media storage. Design of the storage area should take into account: weather factors such as precipitation (for example, runoff from the material or degradation of the reagent) and wind is also a significant consideration. Wind-blown reagents can affect worker safety as well as movement of reagent from the active landfill areas. To maximize the media’s effectiveness and minimize weather concerns, a covered structure can be constructed to provide protection. 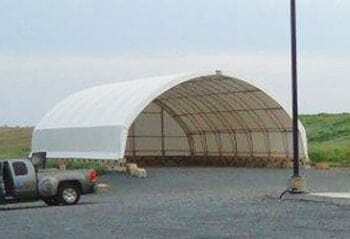 These are often simple pre-engineered or arched fabric structures. As a value-add for customers, a solidification facility can provide a truck wash-out facility. While this is very helpful for facility users, the cost to set up this operation as well as the difficulties to remove settled solids in the trucks can add to the volume of liquids needing to be bulked. If a wash-out facility is provided, costs associated with the additional liquids/solids/reagent should be included in the cost model. Individual conditions will vary, but a clearer understanding of the environmental risks of a solidification operation should help you correctly assess the costs to develop the facility. There are very few opportunities in the waste industry that are completely free of risks and environmental concerns, but a clearer understanding of those risks and concerns allows for a proper design and operations approach to ensure the work can be performed in a responsible and sustainable matter. Figure 3: Alternate storage option for solidification pit supplies. Once the profit potential has been identified and a design plan for constructing the bulking facility in an environmentally viable manner has been determined, establish a complete picture of what processes and accommodations will need to be put in place for the facility to operate successfully. While the profit potential for a solidification operation is a tempting possibility, there are many new/additional processes that will need to be put in place at the landfill. First, the gate staff will need to be trained to properly advise incoming liquid vehicles on where to proceed. Additional signage may be required to assist the driver in getting to the proper location. At the solidification pit, staff should be on hand to advise and observe the third-party that is unloading the liquid. These staff members should all be trained in proper liquid handling and spill control procedures. Staff will also need to be operating yellow iron to mix the material with bulking agents and test the resulting product to ensure it meets the standards required for landfilling. Once this threshold is met, the material is typically loaded on a truck for transport and unloading at the desired location in the landfill. In addition to keeping liquid/wet waste acceptance data, the landfill will typically be required to track the volumes of liquid/wet waste, the amount of reagent/solidification materials used, resulting tons and disposal location in the landfill. There may also be daily, monthly or annual solidification logs, inspections or other information requiring attention from personnel beyond normal landfill operations. These considerations are not individually difficult, but they do represent a departure from operations of a typical landfill, and this will need to be understood for proper evaluation of its effect on the facility. A landfill facility represents a large investment of capital and other business resources. Introducing a new stream of income from materials previously incompatible with landfilling can represent a way to help a landfill deliver improved returns on investment. The acceptance, solidification, and landfilling of appropriate liquid wastes can be much more profitable on a per-ton basis due to the increased value added through the bulking process. This means the tons that are being put in the landfill can be generating more revenue. In markets with stagnant or diminishing waste generation, this is an opportunity to solidify your position in the marketplace. Does constructing a liquid bulking (solidification) pit at a facility make sense for you? Only you can truly know the answer to that, but having a clear understanding of all the costs, risks and operational needs will allow you to best determine whether this opportunity aligns with your facility’s future goals. Evan Williams is a Design Project Manager at Cambridge Companies (Griffith, IN), a design-build firm working with the waste industry for more than 20 years. During this time, more than 100 solid waste design-build projects have been completed including new build, repairs, upgrades and/or modifications at transfer stations, recycling centers/MRFs, hauling companies, landfill facilities, office buildings and more. Cambridge continually monitors the industry to determine any new needs, changes or improvements that will benefit their clients and improve their design-build solutions. Evan can be reached at (219) 972-1155, via e-mail at EvanWilliams@CambridgeCoInc.com or visit www.CambridgeCoInc.com. Randy Bodnar, P.E. is a Vice President at Civil & Environmental Consultants, Inc. (Phoenix, AZ), an engineering consulting firm working with the waste industry for more than 25 years. He has experience in the environmental, civil and geotechnical fields. Randy spent 12 years of his career working for large and mid-size solid waste hauling and disposal companies in site, regional and director of engineering positions. Given his experience, he has developed an expertise in directing complex environmental projects at solid waste facilities, including issues related to environmental monitoring and compliance systems, major and minor permit modifications, landfill development, landfill gas systems, leachate treatment plant development, wetland mitigation and closure activities. Randy can be reached at (602) 644-2160, via e-mail at rbodnar@CECInc.com or visit www.CECInc.com.